Diesel engines are everywhere. They power cars, trucks, buses, motorcycles, rail cars, heavy vehicles, and mobile equipment, such as bulldozers, cranes and tractors, and commercial boats. And that’s not even the full list of diesel-powered vehicles. 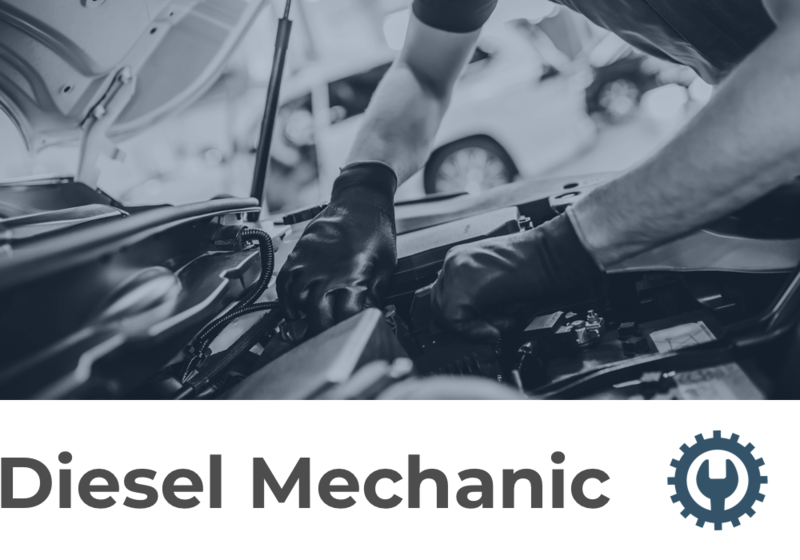 If you love tinkering with engines and don’t mind getting dirty while you make good money, you might want to consider becoming a diesel mechanic. Given the sheer number of diesel engines around, you’ll never be out of work. No matter what kind of diesel engine you work on, as a diesel mechanic, you will be inspecting, repairing, and/or overhauling any of the above-listed diesel engine vehicles. They also are responsible for working on a vehicle’s electrical and exhaust systems to make sure they comply with pollution regulations. In previous eras, this work was a much more straightforward operation. You opened the hood of the vehicle, leaned in, and started “operating” with your hands and hand tools. For sure, these tools are still in use today: pneumatic wrenches, lathes, grinding machines, welding equipment, and good old-fashioned pliers, sockets and ratchets, and screwdrivers. As a diesel technician, you will own most of these hand tools no matter where you decide to work. But today’s engines, diesels included, are far more complex due to the advent of electronics. For instance, microprocessors now maximize fuel efficiency in fuel injection and engine timing systems. Along with some of those hand tools, diesel mechanics now use laptop computers to help locate engine problems and to make appropriate adjustments. In general, this career involves repairing machines; troubleshooting for causes of problems, and coming up with solutions; operation and control of equipment or systems; operation monitoring—watching gauges, dials, etc; and applying critical thinking skills in all situations. You look over the work order, determine the scope of work, and consult with the customer. You use charts and manuals to plot out the necessary repairs. You inspect the parts, from the hood to bumper. You may need to use a checklist to make sure you didn’t miss anything. You use diagnostic testing to figure out what’s going on with the vehicle. Repair or replace anything damaged. Most often, you’ll be doing basic maintenance, whether it’s an oil change or replacing fluids, and rotating the tires. Once you’ve made the necessary repairs, you test drive the vehicle to make sure you did the outstanding job you’re known for. The location for your work as a diesel mechanic hasn’t changed much since the old days. You’ll be spending most of your time in repair shops—noisy, but, these days, probably far better ventilated. Now and then, you may find yourself servicing vehicles on roadsides or other worksites. Also unchanged since those good ol’ days: your work schedule. It’s full time, plus overtime, plus evenings, plus weekends. Of course, it won’t be all these all the time, but if you aren’t interested in a demanding work schedule, this isn’t the career for you. One important note: The BLS indicates that diesel service technicians and mechanics have one of the highest rates of injuries and illness of all occupations. Hoisting up all those heavy parts, dealing with greasy and dirty equipment, and twisting your body into a variety of pretzel-like positions can cause numerous sprains and cuts. Learn the safety precautions and take care of yourself—as you do those engines! According to the BLS, the median annual wage for diesel service technicians and mechanics in 2017 was $46,360; that means half of these workers made more, half made less. When you first start out, you’re more likely to make around $30,000 a year, joining the bottom 10 percent in this field. But that’s true of just about any job. The good news is that the highest earners made more than $69,870. More good news: the BLS forecasts employment of diesel service technicians and mechanics to grow 9 percent between 2016 and 2026. This is about the average rate for most occupations. Translation: stability. But the BLS also notes that as more freight is shipped across the country, especially where trains and pipelines are not available or too expensive, more and more diesel-powered trucks will be needed to ship freight. Meanwhile, diesel cars and SUVs are becoming more popular, so even more jobs for repair and maintenance will be available. How Do I Become A Certified Diesel Mechanic? While plenty in this career, after graduating high school, will learn on the job over three or four years, more and more employers prefer technicians who have completed some type of postsecondary training—and have earned certification. The primary certification in this field is the National Institute for Automotive Service Excellence (ASE). While some may say such certification isn’t formally required, these days it is highly encouraged. Attending a community college or trade school that offers certificates or diplomas for diesel engine repair. You’ll have both classroom instruction and hands-on training when you enroll in these programs. You can specialize in areas such as drivetrains, electronic systems, and preventative maintenance and inspection. To be eligible for certification, you must have two years of work experience and pass at least one ASE exam. You must get recertified every five years. Many diesel mechanics also need their CDL, which allows them to test drive the trucks and buses they work on. How Do I Know This Is the Right Job For Me? The ability to interact with customers. You need to “translate” automotive issues and repairs with the owners of the vehicles you are repairing. That calls for the ability to listen well and answer customers’ questions in terms they can understand. Detail-oriented. It’s not always the big problems that sideline vehicles. Often, it is the small pieces, electronic or mechanical malfunctions that are at fault. You need a sharp eye along with your training to spot these issues. Manual dexterity. This means you have a steady hand, and good hand-eye coordination. This is what you’ll need for taking apart and reassembling a large variety of parts and components. This entails deft use of those hand tools. Organizational skills. Everyone has seen their share of repair shops that are a complete mess and in desperate need of cleaning, even by repair shop standards. Keeping all those parts and tools and equipment in place is key—plus, it’ll save you hours and hours of work spent searching those tools and parts that should be easy to reach for. Physical strength. Oh yes—some of those parts and tools weigh a lot more than you wish they did. Lugging around heavy objects comes with the territory. The ability to troubleshoot. You have all the diagnostic tools, sure, but you must be good at interpreting them in order to figure out what exactly went wrong with this diesel engine. You must be adept with electronic control systems and whatever tools are needed to finish the repair job. You now have all the, well, tools, to figure out if being a diesel service technician and mechanic is the right career for you. If all this information sounds like something you’ll be able to handle, then you’re ready to head down the path. With high school diploma in hand, it’s time to find a mechanics school just right for you! Some of this information originally found on: What Does a Diesel Mechanic Do?